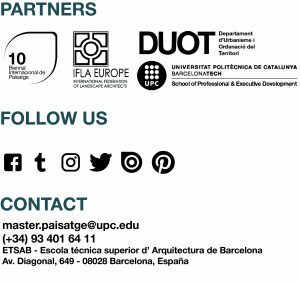 THE GREEN PUBLIC SPACE – Master in Landscape Architecture Barcelona – Universitat Politècnica de Catalunya – 35ª EDITION. The purpose of this workshop is to present the personal vision in the landscape design of a renowned professional-professor, taught as an intensive course.The issue is subject to the proposal of the visiting professor, but related to the first major workshops, The project of public space and Systems of Green, as is held parallel to these subjects. Is held over the second week of december, 2019, from with classes from Monday to Friday from 15:30 h to 20:30 h.